Bo and myself have been discussing the possibility of running our last round this year as an enduro, Le Mans style. Standard Ninco McLaren F1 GTR with Nc1 motor fitted. I tried my Ninco Porsche GT1 but found it to be consistently faster than the McLaren so we decided the one car is easier to stick with. Standard Ninco chassis although either the old chassis with motor pod or the new long can chassis can be used using Ninco NC1 mounts. We have excluded the "Lack" Car as it runs the larger diameter wheels of the Honda NSX giving it a speed advantage on Bo's fast track. The other reason for excluding it is that it is a JGTC car and did not race at Le Mans. We want to keep it reasonably authentic although obviously cars from different years will race. Light set fitted to the car as we are to run a day night format were half the race will be run with lights on and half with a blue moon style light only. We have been fitting Ninco light sets as they fit easily. Weight can be added to the chassis. We will add more updates as time moves closer to the race. I just want it recorded that those two Maclarens of mine temporarily at Bo's for photos are not host cars. They are still there, aren't they (note to self, check eBay fast). Do the Ninco lights stay on if the car deslots, like a homing beacon? Yes the lights do stay on and your Gulf car runs just fine. I am surprised how fast those tyres on your car wear though. Must be a bit perished. And those decals on the car wear very quickly when the car rolls. We went for the Ninco McLarens only as Bo's track is very fast and different cars with similar engines can run differently. Hey Glenn your Mc laren's are just fine, here are some pics of a few that turn up on friday night test run. Here is an underbody shot of the Ninco lights fitted to my old Gulf McLaren. The car is well used and not worth a cent so fret not all you collectors. We are hot glueing in the lights. I am still to enclose them and paint black around the underbody to stop the lights bleeding through the body. I have also bought some new wheels which come in white as the old originals reqire glue to hold them on and are not the truest wheels around. They also have brakes on them which are easily pressed off to allow the wheels to be painted. I have since painted the brake discs German Grey which is the colour of the carbon brakes of the race car. They are not all Bo's cars there. Stick with the maclarens only with nc1's and some weight and it should be a good race. All running lights will look good too. You have got me there with the Le Mans and Lack thing. About the wheels though. The Lack runs the new Ninco wheels which are 21.5mm in diameter whereas the old McLarens run 20.5mm diameter wheels. I measured them with verniers before replying. The new wheels are the same ones as on the Hondas and some of the Supras. This was the original reason for excluding the Lack. The SOK and Fina cars run larger wheels than the early cars such as Gulf and Harrods but the early cars have bigger diameter tyres which have a taller profile. In the end all we wanted to do was create a race with parity as we want to encourage a few more people to turn up. Bo's track is very fast just like Le Man so a simple format such as one make of car is the way to go. 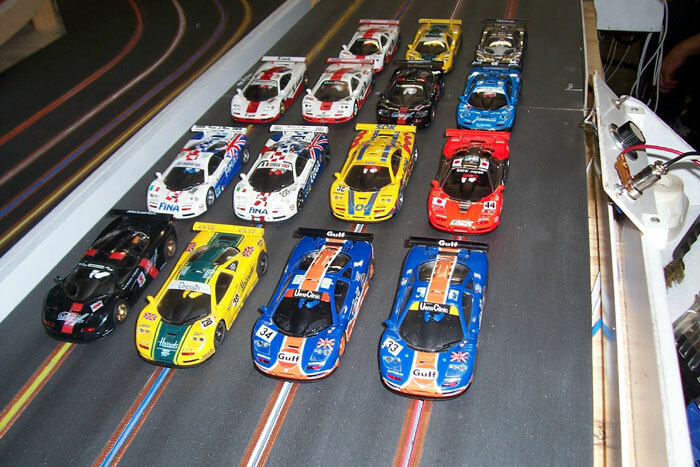 There are enough McLarens that you will be able to race one. I am sure there is one in your collection that you have used enough to not worry about a few scrapes. In the end any car can be a collectable if you wait long enough. They are only around 55 to 65 dollars and were made to race. Maybe you should take up diecast collecting instead. I wasn't worried about my cars but some of the others might fret a little after experiencing the squeeze section firsthand. How many cars tried climbing over my poor little Ferrari (I think it was 4) ? That poor one armed driver had such a headache on Sunday. 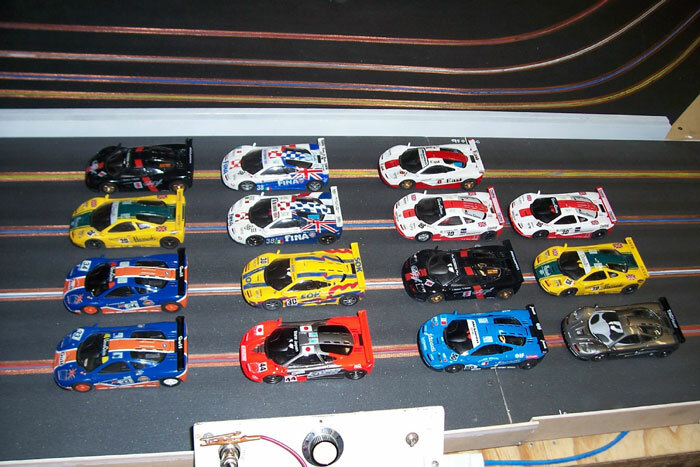 Found this diecast site which shows just how many short tail liveried McLaren F1 GTR's there were over the years. Many more still to come for Ninco. Great racing last night, lots of really close racing. I had a terrific time. Thanks to Bo and the guys for putting on such a top event. Gee Bump, Are you ever going to get around to doing the results for the enduro? Rob, I sent them out already. Except your copy doesn't arrive until you post that well overdue Hotel Room plastic chassis article -- how long ago did you promise that one? We'll make that an early 2006 project and get some photos like a recipe. If its as easy as you say, then there will be more guys and girls interested in making up a few.